The U.S.S. Enterprise patrols near the Neutral Zone with the Klingon border when it receives a distress call from a battered Talarian freighter, the Batris. The damaged ship’s reactor is near overload status, and an away-team led by Commander Riker (Jonathan Frakes) beams over to search for survivors. Geordi LaForge (Levar Burton) uses this opportunity to test his Visual Acuity Transmitter, a device which transmits back to the ship what he sees through his visor. There are survivors aboard the Batris: three Klingon warriors. Korris (Vaughn Armstrong) Konmel (Charles Hyman) and K’Neva (David Froman) claim that they helped to defend the Batris when it came under attack by Ferengi, but their story has holes in it, and Captain Picard (Patrick Stewart) is suspicious. Lt. Worf (Michael Dorn) befriends the Klingons, in part to learn the truth about what happened on the Batris. 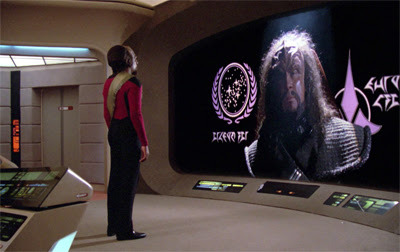 His close connection to his own people, however, does not hide the fact that, since his adoption by humans, he has never been fully at peace with his Klingon heritage. When the truth is known about the Klingons, Korris and the others launch a surprise attack on the Enterprise. 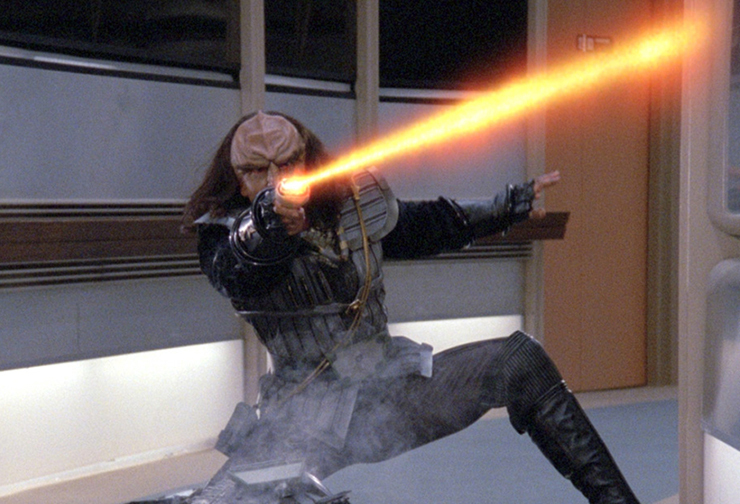 This violent act requires Worf to step in and defend his friends, against his people. 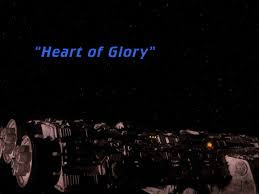 For my money, “Heart of Glory” is one of the best episodes of Star Trek: The Next Generation’s (1987-1994) first season. The episode embraces a beloved race from the original series (the Klingons), explores Lt. Worf’s history and back-story, and, finally, features some real, honest-to-goodness action. At one point in TNG’s development, an edict apparently existed that the series would not revisit races seen in the Original Series. Thank goodness, this policy was re-thought, or abandoned. Today, The Next Generation is probably best remembered for two story arcs. One is the introduction of -- and invasion by -- the Borg (“The Neutral Zone,” “Q-Who,” “Best of Both Worlds,” etc.). The other involves Klingon politics and culture, and Worf’s difficult interaction with his own people. Had the original creative edict stayed in place, we would not have witnessed great episodes such as “Sins of the Father,” or “Reunion,” or “Redemption,” which are all part of a multi-season mini-arc of sorts. “Heart of Glory” is undeniably the first chapter of this tale; one that explores Worf’s uneasy relationship with his own people. This is the episode in which we first see Klingons eat, for example, and thirst for combat, adventure, and most importantly, honor. 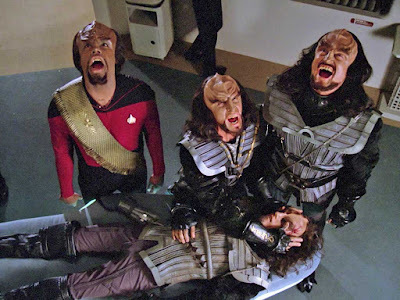 “Heart of Glory” is terrific, however, because it makes the Klingons dangerous and unpredictable, while also revealing their now-notorious “death scream” custom/ritual. Korris and the others are formidable foes. Their values are very different than those we see explored in the UFP, or aboard the Enterprise. Given this, it makes sense that Picard, Riker and others seem to be “on alert” in the presence of the galaxy’s greatest warriors. More than that, however the story explains to audiences the details of Worf’s past that were heretofore unknown. We learn in “Heart of Glory” that Worf was adopted by humans after Romulans attacked his home on Khitomer, and killed his Klingon family. Young Worf then lived on Earth (with a human step-brother), but always felt as though it wasn’t truly home. Like Spock in many important ways, Worf has “repressed” his Klingon feelings and longings so he can fit in with humans in Starfleet. But he is always an outsider. “Heart of Glory” explains that outsider status for the first time. It’s actually strange to think that the series has gone through so many episodes, already, and that this is the first tale that begins to paint in the details of Worf’s background. I’ll confess, this episode really hit the mark with me in 1988, when I first watched it. As much as I loved The Next Generation and was hoping for its success, the vast majority of the first season catalog, while interesting and even intellectually stimulating seemed to lack not merely the color of the original series, but the adventure; the danger. 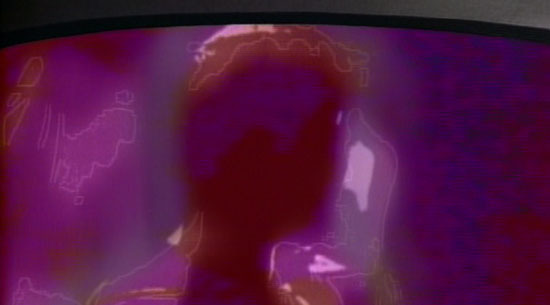 Watching these episodes, it often seems as if the 24th century has evolved past the idea of “danger,” even. One weird thing about all nineties Trek? No matter the crisis, you almost never see any crew people running, or even moving quickly. Seriously, watch TNG, or even DS9, and this is the case. Well, “Heart of Glory,” at least, feels dangerous. From the looming Klingon battle-cruiser on the view-screen, to the mystery surrounding Korris and his team, to Riker’s worried exclamation about “Klingons,” this episode suggests that there are some things in the universe that even Starfleet’s finest people countenance with concern or worry. And then, the episode goes the extra mile by revealing the cleverness of the Klingons, as they use (hidden) elements of their body armor to create weapons and escape from the Enterprise’s brig. Following this (beautifully-scored) sequence of battle preparations, there’s a chase through the corridors, and a battle between the Klingons and Tasha’s security forces. For once, it feels like Star Trek: The Next Generation considers action important, and something that it should focus on, if the franchise is to continue. Not every problem, even in the future, can be resolved through conferences. Not every note here is perfect, of course. As is the norm in the first season, the writers fail to consider how their choices make Picard seem like a poor captain. To wit: in the opening act, Picard sends his away team to a ship on the verge of blowing up. That’s part of the job, of course. But once Picard’s team is in danger (and the clock is ticking), Picard seems to spend endless minutes satisfying his curiosity about how LaForge’s VISOR works. He seemingly forgets -- until tersely reminded by Riker -- that this is a life-and-death mission. The Absent Minded Professorial Captain. A good captain should be able to put aside his curiosity at a time like this. This (poor) moment in an otherwise superb episode characterizes the variable quality of The Next Generation in its first season. The writes craft a tense, compelling character-based story for Worf. But then they ham-handedly shoe-horn in some character development for LaForge, so the audience can see what he sees. Of course, in seven seasons, the Visual Acuity Transmitter is never seen or mentioned again. At this point in the series, it seemed inevitable that we would encounter Klingons. I had gotten my hands on the writers' guide for the show, but that was so long ago that I don't remember if it was before or after this episode. Worf's history, as I recall, was pretty well fleshed out. They just needed to fashion an episode around that history, so it seems "Heart of Glory" was already being planned to address it. I must confess to being disappointed that the alliance between Klingons and the Federation was spotty at best, and that Worf was raised by humans, and thus, not a "true" Klingon. Perhaps I wanted to see what the Organians had predicted - Humans and Klingons working together. However, there is no denying that this is a great episode, and Worf was a better character at the end of it. The Klingon death ritual alone is a fantastic addition to the Star Trek Universe. This is another harbinger of great things to come, and we would not be disappointed.